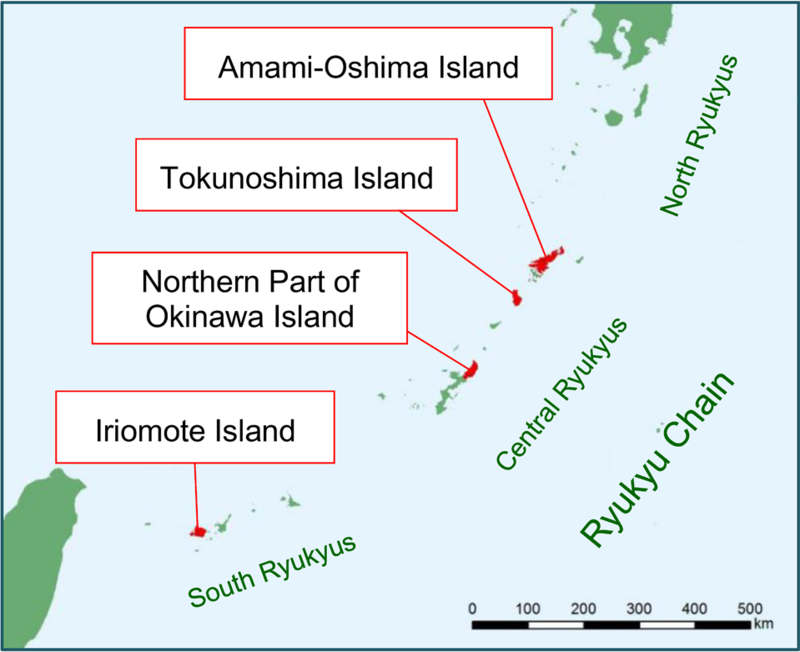 Belonging to the Ryukyu Chain located at the south end of the Japanese Archipelago, the nominated property has a land area of 37,946 ha comprising of four regions: Amami-Oshima Island, Tokunoshima Island and the northern part of Okinawa Island in the Central Ryukyus; and Iriomote Island in the South Ryukyus. Influenced by the Kuroshio Current and subtropical high-pressure, the nominated property is in warm, humid subtropical climate and covered mainly with evergreen broadleaved rainforests. The Ryukyu Chain is believed to have been formed through the formation and expansion of the Okinawa Trough and associated tectonic uplift and subsidence caused by subduction of the Philippine Sea plate beneath the Eurasian plate that had occurred since the middle Miocene of the Neogene. The Ryukyu Chain was then divided into the North Ryukyus, the Central Ryukyus and the South Ryukyus by deep straits lying between islands. Then since the early Pleistocene of the Quaternary, sea-level changes repeated the process of separation and unification of neighboring islands. This geological history created opportunities for speciation and endemism for non-flying terrestrial creatures in the Central and South Ryukyus. Also, the Central and South Ryukyus have differences in their patterns of speciation and endemism in the terrestrial biota because of differences in the distance from the continent and the timing of separation. The nominated property comprises representative four regions of the Central and South Ryukyus which are home to particularly large number of endemic species and subspecies of various organisms. 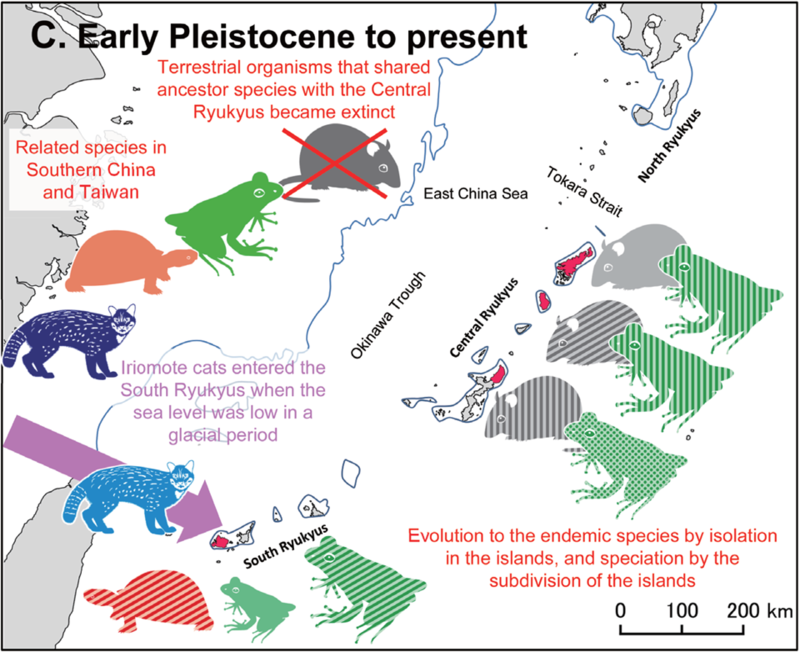 By examining them collectively, we can understand the ongoing processes of speciation and diversification of evolutionary lineages that reflect the geological history of the entire Ryukyu Chain. The nominated property is also an irreplaceable habitat for at least 1,808 vascular plant species, 740 terrestrial and freshwater vertebrate species, 6,148 insect species, 47 freshwater decapod species, and 88 threatened species listed on the IUCN Red List. 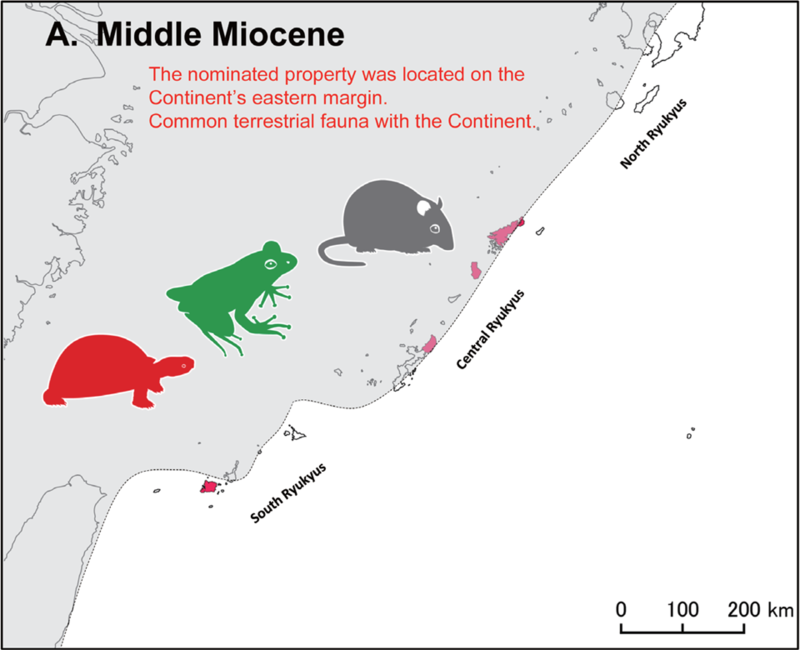 As such, the nominated property is a good example of the ongoing process of speciation and endemism that reflects its formative history as a continental island involving long-period isolation. It also has an invaluable natural environment, including habitats for various endemic species and threatened species of international significance. The current Ryukyu Chain including the nominated site was apparently located on the eastern margin of the Eurasian Continent and shared a common terrestrial biota. The Okinawa Trough began to expand. Tokara Strait and Kerama Gap were formed. The fauna on the Central and South Ryukyus started to follow a unique evolution process after the former group of islands had been separated from the continent with their terrestrial biota consisting of Amami rabbits, spiny rats, ground geckoes, habu vipers, tip-nosed frogs, etc. in the late Miocene (11.63–5.33 Ma). The latter group of islands had been isolated from Taiwan and the continent with its terrestrial biota consisting of Yaeyama yellow-margined box turtles, Kishinoue’s giant skinks, Sakishima habu vipers, tip-nosed frogs, etc. in the Pliocene (5.33–2.58 Ma). 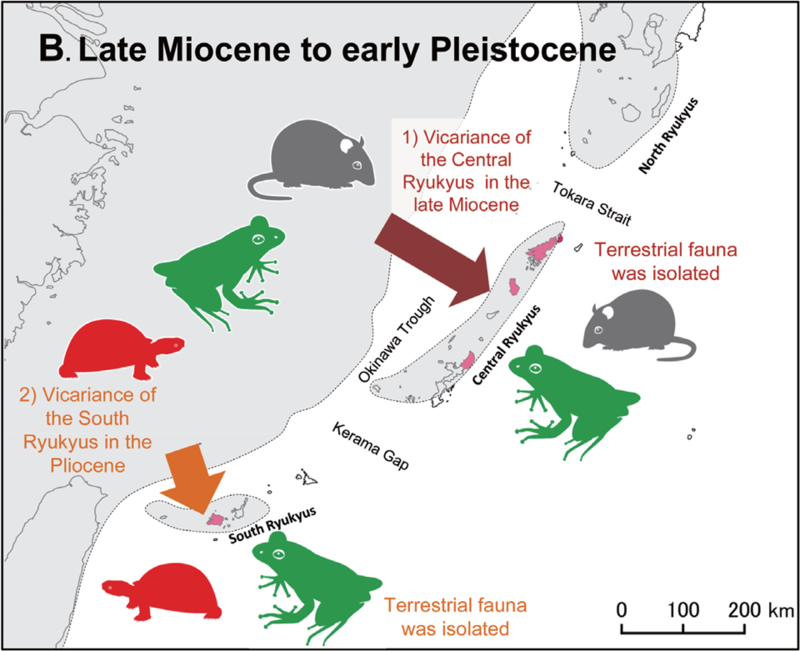 The terrestrial organisms that shared ancestor species with those on the Central Ryukyus became extinct gradually on the continent, leaving a relict and endemic terrestrial biota on the Central Ryukyus. Sea level changes associated with climate changes (glacial-interglacial cycles) caused repeated connections and separations among neighbouring islands. As a consequence, these islands’ biological distribution was fragmented and island-specific speciation was accelerated. When the sea level lowered during a glacial period and the distance between the South Ryukyus and the Eurasian Continent/Taiwan was shortened to a minimal level, Iriomote cats seem to have entered the South Ryukyus (0.09 Ma).